Harry Potter from Orlando to London: Magic’s in the Air! Quidditch in Orlando this summer? Just when you thought the Harry Potter phenomena was waning (and you could sell your capes and wands at the garage sale) Universal Studios in Florida is about to open Wizarding World of Harry Potter Adventure. I have been following the progress and as jaded as I can be about commercialism I am intrigued. Mostly because I want to see how things will match up with Rolling’s mega series. And really who doesn’t want to eat at Three Broomsticks and go to Ollivanders Wand Shop. Naturally Universal Orlando Resort has created family vacation packages that include early park admission, breakfast at the Three Broomsticks, and Universal Express Access (Beginning May 28, 2010). 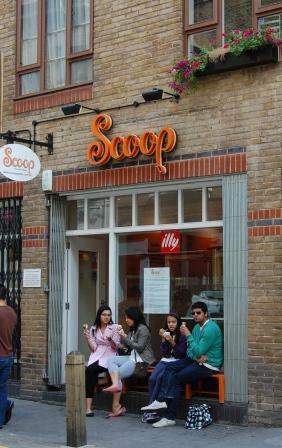 This is a fantastic gelato shop, Scoop, located near London Walks! Need a replacement wand? The spirit of Harry Potter is still alive and well in London. Every Sunday afternoon London Walks provides Potter fans a lively walk about town recreating more than a bit of mystery. Pure fun with a dose of cleverness best describes the themed outings. For families it is an ideal way to share magic and do a bit of pretending for the fun of it – invisibility cloaks not included. Alan, the engaging guide and Harry Potter trivia expert, relates real tales about real London locales to the fact and fiction of Harry and friends. 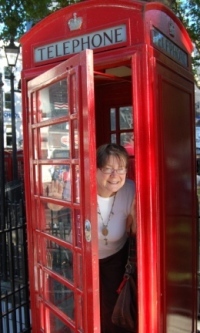 Looking for the Ministry of Magic? Want to catch the night bus? This walk is an authentic experience based on the themes of the very popular Harry Potter book series. Dumbledore does not appear at the Temple tube stop but Alan manages to provide the magic. If the walkabout magic is not enough sign up for the Harry Potter taxi tour of London including film locations: Gringotts’ Wizarding Bank, the ‘Cracked’ Cauldron, the Knight Bus Bridge, the Flying Car “crime scene”, as well as Platform 9 ¾. You get the idea. Neal's Yard Salad Bar & Cafe is a great find - perfect for a seculded lunch in the center of London! “Ghosts of the Old City” or to creep out your teens – “Jack the Ripper”. Sign up for a spy themed walk featuring Ian Fleming’s James Bond and John Le Carre’s George Smiley or follow the Beatles and end up on Abbey Road. I like the Dickens walk but then I also like pea soup and sherry and my husband drinks a blended scotch. London has lots of great activities, and you can find great ways for families to play (and save!) in London here.